This is my 1,000th post on Runs for Cookies! I've been trying for a couple of weeks to put together a meaningful post for the occasion, and I have several drafts prepared; but nothing really "felt" right. One thousand is just a number, really; and if there is one thing that I've learned over the past 1,000 posts, it's that numbers should not be given so much attention. When I started this blog in April 2011, I never expected it to become what it is now. I'd written a blog since 2000, and had just a handful of readers all those years; when I switched over to Blogger and started Runs for Cookies as a maintenance blog, the number of readers grew so quickly it scared me. I always shared such personal things about my life, and having a larger audience made me nervous. As my readership grew, so did my accountability. Knowing that people were reading helped me to stay on track (well, for the most part!) and I started to get a sense of this huge online community of people that support each other in weight loss and maintenance. I started to get e-mails from people who were inspired to start running, which I thought was awesome! I was a guest on The Dr. Oz Show in November 2011. It was such a fun experience! I was selected by Fitness magazine as Best Weight Loss Blog in 2012. I hosted a Virtual 5K last year, and about 500 people ran with me on my 31st birthday! 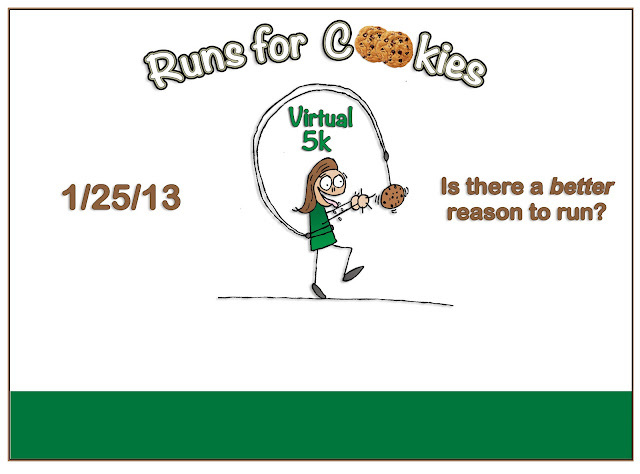 (This Saturday is the 2014 Virtual 5K, which you can sign up for here). I met Rik, a reader of my blog, who later became a good friend and captain of my Ragnar Relay Florida Keys team. He came out to Michigan to run the Detroit Free Press Marathon with me! Purina ONE invited me to their headquarters in St. Louis for an amazing learning experience about one of my favorite subjects--cats! I was only there for about 24 hours, but the whole thing was amazing. I've met quite a few readers! A few people have recognized me at races, and I love it when they say hello. This photo was from when Stephanie and I met up with Kelly from Sublurban Mama at my favorite restaurant--La Pita. I'm still very shy, but having the blog has helped me become more social and step out of my comfort zone. I've had the opportunity to try out some really cool products for review on my blog! One of my very favorites was this CamelBack Marathoner vest. I met Andrea, a reader of Runs for Cookies, and told her I'd run the Chicago Marathon with her. She ended up getting injured, so she couldn't do the race, but I went anyway. It ended up being one of my favorite races of all time! Because of this blog, Mark has gotten literally HUNDREDS of get-well cards! All he has to do is look around his room to see how many people are thinking of him. I met some of the most inspirational people and ran from Miami to Key West with them! We've become very close, and the whole team feels like family to me. None of these things would have happened if not for this little blog! There are tons more, but these are some of the most significant things that come to mind. As you can see, my blog has evolved from a diet/exercise journal to an enormous part of my life. I honestly cannot picture what my life would be like if it didn't include my blog. Thank you, every single one of you, for reading! Congratulations! You are such an inspiration to all of us! Thank you for sharing! You are a huge inspiration! Happy 1,000 post! You've inspired me to start running again after I have my baby and get cleared from my midwife. Congratulations! Here's to another 1000, or so! Congratulations! You really have motivated me and many, many others. Keep up the GREAT work!! Thank you for blogging! This is one of my favorite places on the internet. :) Happy 1,000! Congratulations, Katie! Yours was one of the first blogs I came across last year when I was a few months into my own weight loss journey. I love reading your posts; I love your candor about your journey. You post the ups and downs of weight loss and maintenance and it is wonderful. Thank you and here's to many more posts! Blogs really need to have like buttons! I love reading your daily posts Katie! It helps keep me going some days! Thanks for all that you do! I'm a relatively new reader and I've just finished reading back through the archives - so I think I've read all 1,000 in the last week! I was really stagnating with my running - particularly after a couple of foot injuries and inexplicably fainting (sound familiar?) and breaking my nose before Xmas - and you've really given me the inspiration I needed to get start to push myself. On the weekend, I managed to run 8km for the first time since July and I must credit you in part for getting out of my 5km comfort zone. Congratulations Katie! 1000 amazing blog entries. You are fantastic and your positive energy radiates through your blogs! And you are such an inspiration to us all - you share your successes, your slip ups, your struggles, and your amazing transformation, and it's so inspiring. Thank you for all you do! Woooohooo! Congrats! I can't tell you how many times I have gone back and read your blog posts - for inspiration, for advice, and just to remind myself that if you work hard, you can achieve ANYTHING! I hope that blogging continues to motivate and inspire you as it does for all of us. Here's to many, many more awesome blog posts! Congratulations! You have certainly inspired more people than you probably realize. Keep 'em coming! Congratulations and grateful to have been a part of it. Thanks for writing this blog Katie- I started reading for the maintenance posts but stay because of how awesome you are. Happy, happy, happy 1000 posts, Katie!! Just as amazing as all of the accomplishments you've listed is the number of people you've inspired to make HUGE changes in their lives--like me!!! Without you and your blog, I seriously do not believe I would have ever gotten to my goal weight, and I know I would have never been inspired to run. 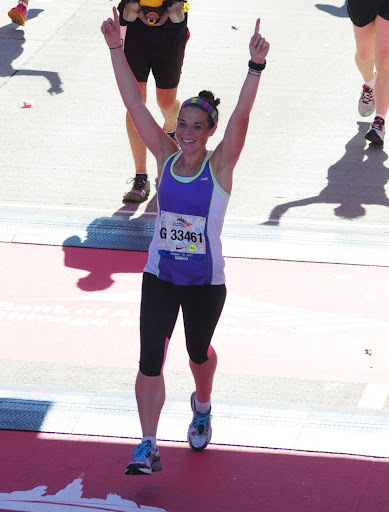 Two years ago, I couldn't run a half-mile...now I'm training for a marathon! Thank you for all the time and effort you put into your blog--it is such a positive influence on my life and obviously MANY others' lives, as well!! Here's to the next 1000 and more!! What an amazing experience you have had with this blog. I am looking forward to virtually running with you on Saturday! You are a super cutie, and it is my extreme pleasure to read your blog. Here's to many more inspiring posts! Thanks! I have been loving reading your blog (I actually mentioned you and linked back to one of your posts in my blog today!) - I've been going back and reading your old posts (currently reading about your pre-marathon training in 2012) and it has inspired me so much. I'm not much of a runner, but I've always wished I could be. I just love your honesty and the way you write! Thank you, thank you, thank you! And congrats on 1,000! You forgot to say about the interview on NBC in December 2012 when you were in Florida, that's when I heard about your blog for the first time and I Have been reading since then. You are amazing and I can't wait to keep reading. Keep up the good work! Congrats! Thanks for posting daily--I always look forward to it. You inspired me to FINALLY start running after thinking I couldn't for years. happy 1000th post! thanks for being a constant and REALISTIC inspiration! Congratulations on 1000 posts! Thank you for being such a huge inspiration and keeping it real!